REA and Lifson now try to say that they can’t be “100% sure” that the bat was game used by Jackson but they fail to note that there isn’t even 1% of a chance Jackson ever held the bat in his hands. Lifson and REA have now backtracked from their claims of “Game Use” made on ESPN and appear to now be at odds with the letter opinion provided by PSA/DNA. The reversal of REA’s original position, however, does not address the fact that PSA/DNA still has no evidence whatsoever to support its claims of game use by Jackson. So, although REA now claims that Jackson game use cannot be determined, they still see fit to keep the bat in the auction. In addition, by leaving the lot in the sale, REA and Lifson are violating their own auction rules and regulations by selling an item that has two conflicting letters issued by authentication companies. 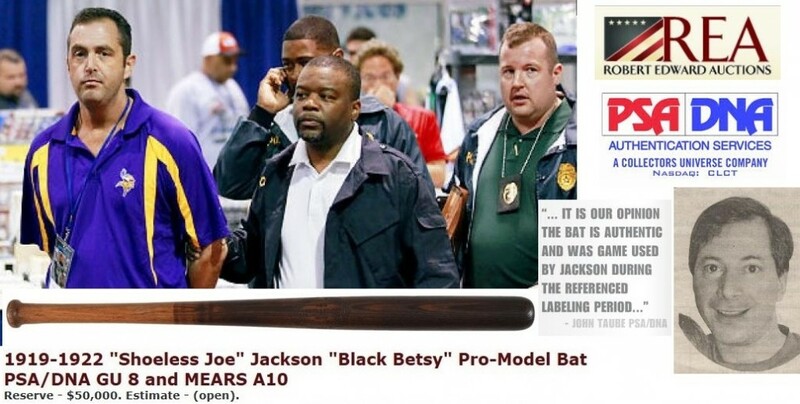 Based upon their own rules, REA should never have allowed the Jackson bat into the auction in the first place. But not only did they accept the consignment, they also falsely claimed in the lot description that MEARS and Troy Kinunen had agreed with John Taube and Vince Malta of PSA/DNA that the bat was “game used” by Jackson. That claim by REA was entirely false and appears to have been written in a manner to deceive bidders. By posting an addendum to the lot REA does not go far enough in addressing the authenticity issues with this bat and REA’s violation of its own rules and regulations. In addition to concealing the true opinion of MEARS in the original lot description, REA also concealed the provenance of the “Black Betsy” style bat which is also accompanied by a third expert letter of opinion issued by SCD Authentic in 2004. That letter, which REA chose not to include on the auction site, accompanied the bat in 2004 when it was sold by Vintage Authentics which is operated by Steve Jensen, the dealer who was recently convicted in a Federal case that charged him with selling fake “game used” memorabilia. The Jackson bat currently for sale at REA appeared in a 2004 Vintage Authentics auction graded A10 by SCD and was featured (and illustrated) in an SCD article written by Dave Bushing. Jensen and Vintage Authentics appeared linked to the same Black Betsy bat in a 2004 article published in Sports Collectors Digest and written by bat and equipment expert Dave Bushing. In the article Bushing describes the bat (which is also illustrated) and never indicates “game use” by Joe Jackson stating that, “There (was) no player name on the barrel and no provenance aside from photographs of Jackson with the exact style bat.” The bat was scheduled to be part of Jensen’s Fall 2004 auction which specialized in game used items. Jensen told Bushing at the time, “Since they (SCD Authentic) started grading all of their game used bats, the amount of game used material in our auction has tripled.” At the time, Bushing and Troy Kinunen were the bat experts working for SCD Authentic. PSA/DNA’s current letter of opinion stating that the bat was game used by Jackson is dated September 23, 2013, and it is unclear if it was submitted by the consignor or REA for its current auction. Both PSA and PSA/DNA have faced accusations that they give big clients and major auction houses preferential treatment when it comes to issuing high grades and determinations of authenticity and game use. The letter of opinion issued for this Black Betsy bat is representative of what many identify as PSA/DNA’s questionable business practices. The fact that there is no clear-cut evidence whatsoever supporting PSA’s claim of game use for Jackson just supports the worst fears of many hobby insiders and collectors who rely on PSA opinions. PSA President Joe Orlando (left) says that his experts would never "stretch the truth" but that's exactly what John Taube (center) did with the Black Betsy bat consignment to REA. Not only have REA and Lifson violated their own regulations regarding conflicting opinions but they also have, in essence, done what they said they would never do, shopped for an opinion that would turn a generic pro-model H&B bat into one of the hobby’s holy grails— a “Shoeless” Joe Jackson game used bat. PSA/DNA appear to have been only too happy to oblige in providing a fraudulent letter of opinion alleging game use by Jackson. Orlando signed off on his post saying, “Never get cheated.” That’s fitting, because his own expert employees Taube and Malta are the culprits who have stretched the truth here and, in turn, have cheated the current high-bidder on the Black-Eye Betsy bat still for sale at REA. Any way you slice it, it’s $50,000 down the drain. Glad to see that they nailed one crooked dealer and more should follow, as there sure are lot more out there,who should go down also and hope they do, to help clean up the market somewhat and save John Q from getting bilked by the crooks. It’s the very reason I got out of the bat collecting business. There are more slime balls in that industry than you can shake a stick or “game used” bat at. Unless you’re getting this stuff directly from the player or his family (and in some cases, that ain’t even a safe bet), you deserve what you get……if that’s $50,000.00 of your money down the drain…..hate it for you….Halls of Shame has warned us enough times now….shame on you if you get taken!!! vintage scam-thentics are in the business of scamming, how sad that psa/dna is helping them, robert edwards auctions does not care it is fake, as long as it has a coa, so they can point the finger at someone else, for shame on ALL of them! p.s. yeah, jailbirds helping jailbirds, birds of a feather, stick together! never buy ANYTHING they sell or try to auction, so you do not get burned!! The fears of the collecting public is that the winner of the bat will simply discard the mears and scd authentic loa’s, and keep the psa loa, and now will have an ‘unencumbered’ game used joe jackson bat and walk off into the sunset with no more ‘conflicts of dueling authenticators’. The next auction you see this bat will be in an auction with only the game used psa loa. flip for a nice profit. That’s the underbelly of the hobby. Do the right thing and dump this PSA cert now. Looks like Mastro’s sentencing got postponed to sometime in June. I’ll add to Oliver’s post; someday everyone will agree what a disgrace Sports Collectors Digest (SCD) has been to the hobby, starting with Lemke, continuing with O’Connell, who evidently never met a perp he couldn’t make excuses for, and continuing with the kid they have now. I recently got a sample issue in the mail, trying to entice me to subscribe. Sorry, Iola Losers, but I’m not interested.